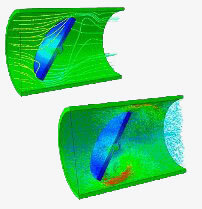 Today, product simulation is often being performed by engineering groups using niche simulation tools from different vendors to simulate various design attributes. The use of multiple vendor software products creates inefficiencies and increases costs. SIMULIA delivers a scalable suite of unified analysis products that allow all users, regardless of their simulation expertise or domain focus, to collaborate and seamlessly share simulation data and approved methods without loss of information fidelity.